I like the level of fame that I have. You get nice tables in restaurants sometimes, but fame isn't something that I find comfortable. I think there's a down-to-earthness with Midwesterners and with people from the Midlands - which is where my family is from - in Ireland. 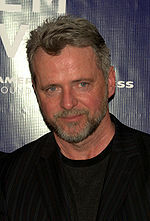 Aidan Quinn (born March 8 1959) is an American actor. He later met McCartney at a hotel and they became good friends. He played a small cameo as the captain of a doomed Arctic vessel in the Francis Ford Coppola-produced adaptation of Frankenstein. He made his film debut in 1984 in Reckless. His films include Desperately Seeking Susan The Mission Stakeout Benny and Joon Legends of the Fall Frankenstein and Michael Collins.